I don't have ridden nor the CAAD12 nor the Allez Sprint or Spooky . A friend of mine had a caad12 and is now on the allez sprint ,he's a mtb racer powerfull and uses road training and race to prepare mtb races . The caad12 was confortable due to the 25,4mm seat post but no it hasn't quality ride . The gap between the headset and the fork is a shame I think . And yes lot of BB finish ovalized on the caad10 and 12 .
can you clarify on the frame not being the same as it used to be? perhaps a large part is the rider is now very used to the nuances of the frame. I'd like to see others weigh in on this, because as an engineer I don't see this as very viable. You shouldn't meet the material limits in that short of time. I have probably 15,000+ miles on this aluminum frame and it still seems to ride just like the day I got it. I enjoy riding and take it out just as often as I do my carbon bike, perhaps even more. I would definitely say that this frame rides a little bit harsher than my carbon bike and that's really saying something, becuse my carbon bike is a Venge, which isn't really known for having a forgiving ride. I've found that sweet spot though in terms of tire sizes and pressures for my size and I'd say that I've negated most of the harsh ride and can ride this bike for long distances. I've routinely ridden it for metric centuries and the longest ride I did on it was 95 miles. I highly doubt you'd get anywhere near the fatigue life of an aluminium frame within 10,000km of 'riding hard'. More likely it's a form of compulsive buying disorder. BB30 is not an inherently poor design, it is a very good and efficient one if done properly. If both the bearings and the frame are manufactured properly so they are round, straight, etc. then BB30 is great. It's light, it's stiff, it has a low Q-factor. Buuut... If the bearings and the frame are not round or straight or of good quality then you'll get creaks and accelerated wear and all those things. It's all to do with manufacturing methods. Things like drilling from each side of the frame rather than all the way through from one side, or not using accurate molds for the shell, soft or not round bearings, all make BB30 a nightmare, when if those are all done properly, it's great. tl;dr BB30 is great if you do it properly, and rubbish if it's not. Raoul Leuscher has some great videos on the subject. great ideas are rarely implemented well at a production level in the bike indsutry and i can say from experance the biggest issue with CAADs is the tolerance issues with the bottom brackets. The bottom bracket picture above is pretty amazing; can't believe that worked at all. I had a CAAD9 w/ BB30 ... creaked. I had a 2014 SuperSix Evo HiMod w/ BB30 ... creaked. I now have a 2017 CAAD12 Black, Inc w/ BB30a ... used Kogel bearings instead of the SRAM or FSA supplied ones (forget which) and it is totally silent. So, maybe I finally got a frameset with decent BB tolerances, the bearings made a difference, or both. Also, not that I can compare w/ Spooky or the other alu framesets mentioned, but I think the CAAD12 rides great. I like it as much as the 2014 Evo, though I think the later Evos were much improved in pretty much every respect. 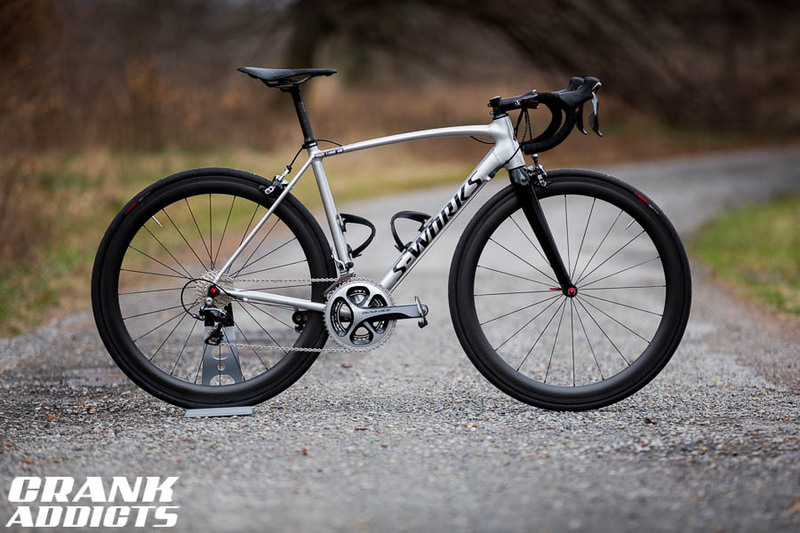 I thought the CAAD9 was harsh, but of course I do now ride w/ wider rims and bigger tires. Anyone? Still curious to know the answer to this. the frame is like a giant bushing and if it's not stiff it'll absorb any power and you lose some of that power transfer. Its a hugely debatable topic...if frame stiffness manifests more speed. Many elite riders believe stiffer is better but keep in mind, they lay down big watts. At steady state, aka constant wattage, many believe there is little efficiency loss because energy by displacement is restored with each pedal stroke. A sometimes lost element in discussion that better riders appreciate is 'control'. A pretzel'ed frame when subjected to big pedal force is a frame under less control than a very stiff frame by a stronger rider. Pedal circles are actually elongated when sprinting out the saddle. This lack of control some contend reduces cadence in a high RPM sprint because the frame is elastically deforming all over the place. Above is why better riders prefer a stiffer frame overall. Some believe a stiffer frame is a more efficent frame but not all. And of course the more flexy the frame, the less it matters to weaker riders who never elastically deform the frame. Big brands design their race bikes for strong riders and why they sometimes feel very stiff to lightweight, low watt riders. But not to Tom Boonen or Marcel Kittel. Sometimes even more stiffness is added to a frame for these men that can push 2000w or almost 3 hp. To them a stock race frame can even feel a bit flexy because of their tremendous power. You're right - the engineering theory is great- but the real-world application of it has been a total and utter disaster. Frankly, Cannondale should hang their heads in shame for unleashing such a disaster on the world. BB30 and all it's press-fit derivations have been one of the worst 'innovations' the cycling industry has foisted upon us consumers - and according to several people who've sampled production frames Cannondale has one of the poorest track records in the industry. (See the first Hambini video linked below - for just one example). Cannondale's accountants (allegedly) invented press-fit BB's to cut manufacturing costs - and then Cannondale's Marketing dept 'sold' us all on the benefits of press fit. And there are a few advantages - larger BB shells mean wider axles, larger diameter axles, beefier DT/chainstay/ST areas etc. Also, supposedly gerater longevity (ha ha ha ha ha). But in far too many cases manufacturers cut corners, don't manufacture with sufficient precision for tolerances, don't have sufficient QA testing, plus many other sins. The result has been awful experiences of creaky, squeaky bottom brackets, many of which have worn out prematurely, some of which have ruined frames, and very, very few of which have ever delivered on the supoosed 'benefits'. Last edited by Digger90 on Thu Feb 22, 2018 9:14 am, edited 1 time in total. Makes sense. Especially the part about energy getting restored. I always wondered why everyone is so concered about stiffness. If you bend the frame out of shape with your power, the frame obviously wants to return to it's original shape. And what gets lost in that process, will come back. Probably a tiny energy loss though. But as you mention, if you're riding an average of sub 400w which al riders do (even pros), the flex of even flexier frames will be marginal. Don't know the physics begind it all, and maybe I'm wrong, but I can't get into my head, if power actually disapears into thin air with a flexier frame. Last edited by Multebear on Wed Feb 21, 2018 9:44 pm, edited 1 time in total. ...Don't know the psysichs begind it all, and maybe I'm wrong, but I can't get into my head, if power actually disapears into thin air with a flexier frame. Not relating to power transfer, but for me if a frame is too flexy it just translates into a sketchy handling bike, the proverbial noodle. I like it to be solid and predictable and not "twisting" all over the place when something unexpected occurs. And I like it to be comfortable. And that's different things to different people I suppose. The ideal bike for a given person is such an individual thing... hard to explain. This ^^ flexy frames don't "drive" well. When your putting down a lot of power (in a race around other guys and corners for exsmple) you really appreciate a stiff bike that doesn't feel vague or "disconnected". For the pros with big ftp's it's magnified even more. In bold above. Just to be clear for anybody here that buys into Hambini videos who is standing on a nickel because he makes bottom brackets....his analysis is downright limited and misleading and Leuscher Teknik who is a bit more credible but the devil is mired more in the details which he doesn't go into with his 'light gloss' videos...any good engineer who has worked in this field...I have....understand's that Hambini...a great circus name btw....does a dis-service with his pseudo analysis. It is highly flawed. His measurement technique and analysis doesn't take into account the entire tolerance stackup of not only BB30 bearing misalignment, but their true position in respective bores but most notably lack of accomodating bearing tolerances which by design account for bore misalignment and also crankspindle relative to bearing bore I.D's. Evaluating or comparing BB30 bore misalignment in a vacuum as he does is basically irresponsible. I know this is well beyond the scope of this forum but in summary, the engineers that design the top frames from the top bike companies understand this. Are all bikes shipped from the top factories perfect? No. Are almost all buildable and ride well with proper BB set up? Absolutely. If not they should be returned to the mfr for replacement frame just like for any mfg defect like poor paint quality. As to the picture shown with ovalized BB. If this came from the factory like this, than of course it is a rejected frame that should be returned for a replacement frame. But pictures like this posted on the internet are abused frames with unknown background. 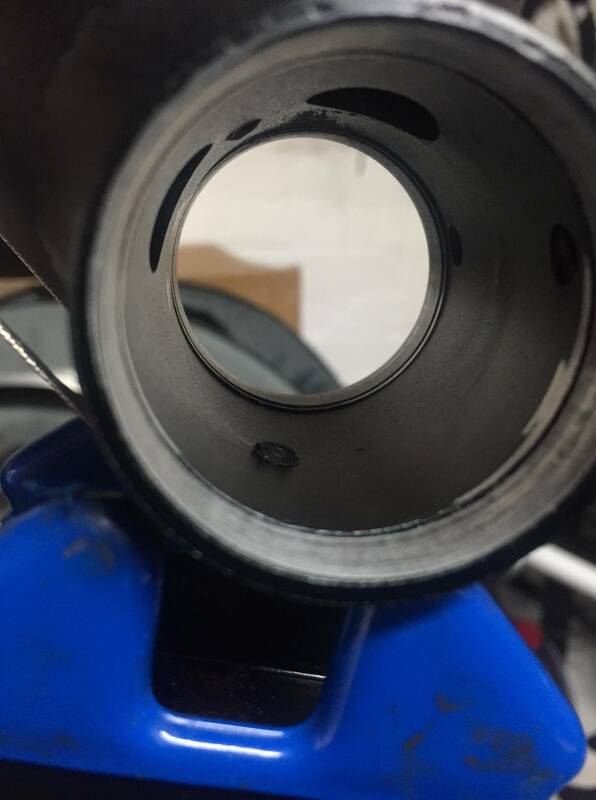 Reality is...if a BB30 bike has a seized bearing due to neglect or abuse....unlubricated bearing subjected to a lot of poor weather riding....the bearing will seize and can ovalize the BB bore. An ovalized bore is many times accompanied by insufficient bearing preload....a condition lost on many that set up BB30. In particular this is a common issue with Shimano cranks that are among my favorite because of their mechanical preload. If preload is misadjusted...either too tight or too loose and non angular contact bearings are used, and the bearings aren't lubricated properly to repel contamination from the environment...and even add it a higher watt rider, you have a perfect storm...a high side of tolerance BB30's will aggrevate this as well. So few understand the true dynamic at play. They only know, they end up with an ovalized BB and don't know why. Virtually all if not most can be avoided with proper set up and good bearing selection and adequate maintenance. This can happen even in degree over time. PF30 is even more sensitive to this with carbon bores. So is BB90 what Trek makes who uses a metal bearing on a carbon bore and unserviced bearings...or common lack of bearing pre-load causes bearing motion in the bore and elongation to the bores aggrevated by poor abrasion resistance of carbon. BB30 is not only better in abrasion resistance of bores compared to BB90 but have better bearing bore alignment with CNC bore machining. For those interested, there is a great level of misunderstanding about press fit on the web. The vast majority don't really understand the design, how its manufactured, what the engineers responsible for it evaluate to ensure its performance etc. Yes, some press fit designs are better than others. Even PF30 can now be tamed by conversion sleeves from the aftermarket or now integrated bearings into cups. Early PF30 bikes had separate delrin cups and bearings and those that worked on them or owned such a bike know what an unmitigated disaster they were...and yes a sad commentary that companies from the aftermarket, saw the flawed designs being promugated and foisted upon the bike riding public from top bike brands and these aftermarket companies created a better mousetrap...in effect, a highly engineered kluge...to bail out these top brand bike makers to make their flagship bicycles more reliable. A sad commentary indeed. But among all of press fit in all its permutations out there, BB30 is among the most reliable if set up properly with Loctite. And for those who don't like to glue metal bearings to metal bores to ensure 0 creaking with proper crank preload often missed, then the aftermarket has come forward yes again...companies like Wheel Mfg and Praxis with their sleeves with integrated bearings which work nicely as well. Of course, all needless when a threaded 68mm shell with threaded outboard cups with integrated bearings aka Shimano, works pretty flawlessly. In summary, pick your frameset of choice carefully. Pinarello and Specialized moved away from their version of PF30....Pinarello in their wisdom, all the way back to 68mm BSA for their most expensive Dogma bikes which are excellent and won the TdF now 3 times.. for a reason after too long.